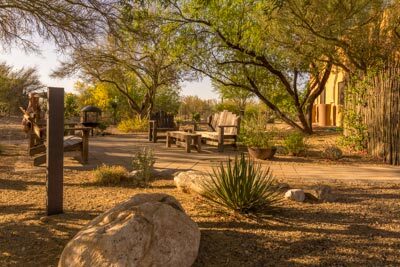 Located on the outskirts of Tucson, Cat Mountain Lodge (520-578-6085, www.catmountainlodge.com) is the perfect place to soak up a little sun, enjoy the evening stars and generally get away from it all. This southwestern style B&B features five rooms, including one which will work for many wheelchair-users and slow walkers. There is a signed accessible parking place near the entrance, however since the parking lot is gravel, it’s not striped. Although guests seem to respect the signage; some wheelchair-users may need a little help over the gravel. Once you get to the flagstone sidewalk, you’re good to go, as there’s level access to the courtyard. In true hacienda style, the guest rooms surround the peaceful courtyard filled with desert plants and a fountain. There is a sliding glass door to the public Arizona Room, which features a computer and printer, books, magazines and coffee to enjoy around the kiva fireplace. Innkeeper Kerstin Block can be found there during business hours, but the room is always available to guests. The accessible Fiesta Room is located just a few steps away. It features a wide doorway; however there is a one-inch lip at the entrance. Inside, the tile floors are accented with throw rugs, and the room is decorated with a definite southwestern flair. Furnishings include a love seat, a table and chairs, a chest of drawers, and two nightstands. There is wheelchair access on both sides of the 21-inch high king-sized bed, and the room also has a small refrigerator. The room is very spacious, but some folks may need to move a piece or two of furniture for better pathway access. 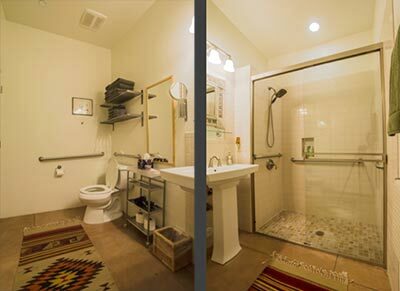 There is a wide doorway into the bathroom which is outfitted with a shower with grab bars and a hand-held showerhead. There is a one-inch lip on the shower, and although it’s 56 inches wide and 28 inches deep, because of the layout of the bathroom, there is only 27-inches of clearance at the entrance. The toilet grab bars are located on the right and back walls (as seated); and the room also includes a 36-inch high pedestal sink with a lowered mirror. Although the bathroom will work for many people, it’s not the best setup for power wheelchair-users, mostly because of the narrow clearance to the shower. The lodge sits on 13 acres, and there’s level access to a nice patio area out back that’s furnished with a swing and some chairs. It’s also the location of Spencer’s Observatory, where guests can book an optional star gazing session. There is a three-inch step up into the observatory, but there’s also a table and chairs outside if you’d like to enjoy the night sky on your own. Guests are also treated to breakfast at the Coyote Pause Cafe, which is just a short walk from the lodge. Although the route is level, it’s best to drive if you use a wheelchair, as the gravel surface makes for tough rolling. There’s accessible parking in front of the cafe, with level access to the building. Menu selections range from southwestern specialties like huevos rancheros and mesquite pancakes with prickly pear syrup, to traditional favorites like bacon and eggs or omelets. Cat Mountain Station, which houses a number of shops, is located next to the cafe. There is level access to Cat Mountain Emporium, The Trading Post, and the galleries that compose the 4,500–square foot shopping center. It’s a good place to find locally crafted jewelry, art work and textiles. The Arizona Sonora Desert Museum (520-883-2702, www.desertmuseum.org) is also located near Cat Mountain Lodge. This combination zoo, botanical garden and aquarium features more than 230 animal species and 1,200 types of plants. There is barrier-free access throughout the garden, with plenty of accessible parking near the entrance, and level access to the entrance plaza. 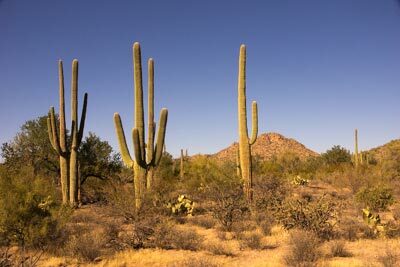 Save some time to visit Saguaro National Park (520-733-5153, www.nps.gov/sagu), which is just up the road. The Tucson Mountain District of this national park features the accessible Desert Discovery Trail, which focuses on desert ecology; and the Bajada Loop Drive, which offers a very scenic view of the saguaro cactus forest. It’s the perfect way to top off a Tucson getaway.